The potent militarist regime of Japan was moving West in the 1930s. Having already annexed Korea two decades earlier, and then adding what was then Manchuria to its territory, it withdrew from the League of Nations and other treaty obligations. The Japanese imperial fighting machine, riding high on a string of conquests, was only one year away from taking Beijing. At home, in order to help monitor public opinion and promote favourable and passive attitudes in its people, the government closely watched its blossoming film industry. Under a string of prime ministers, Japan’s judicial and cultural leaders worked surreptitiously – “unofficially” – to insure that the majority of films followed comfortable, crowd-pleasing formulas providing melodramas that led to satisfying, expected resolutions. The plots of these films were usually based in the home and rarely referenced the wars outside, except in the simplistic and bloodless terms of honour and glory. Mizoguchi’s bitter and bleak Osaka Elegy, shot in only 20 days and with visibly meagre means, was released into the nationalist mood at the height of Japanese military success as a stunning affront to the deeply-ingrained patriarchal and capitalist structures of Japanese culture. Though Mizoguchi would direct more acceptable samurai films under government order in the early to mid-1940s, his country banned all screenings of Osaka Elegy in 1940, issuing the claim that the film’s mood tended toward the “decadent”. As a marker in the career of Mizoguchi, Osaka Elegy is notable for its rarity. Though many of his early works have been lost, this film has been preserved but not often screened. This is likely due to the look of the film itself: the images are thoroughly dark and the direction and editing are often choppy. 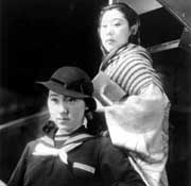 However, many critics assert that 1936, the year in which Mizoguchi also directed the more widely-screened Sisters of the Gion, saw the initial crystallisation of a set of themes, stylistic tendencies, and methods of production that would evolve over the next 20 years, until the director’s early death in 1956. Osaka Elegy marks, for instance, the first collaboration with the screenwriter Yoshikata Yoda, who would co-write many of Mizoguchi’s more famous titles: Miss Oyu (1951), The Life of Oharu (1952), Ugetsu Monogatari (1953), and Sansho Dayu (1954). Though Mizoguchi’s camera techniques are more varied than those of his contemporary Ozu Yasujiro – and to whom he is often inevitably compared – he does favour long shots and compositions in depth in Osaka Elegy, crushing his characters under the weight of the frame and their surroundings. Thematically, Osaka Elegy introduces his command of the dyads of gender relations: fathers/daughters, brothers/sisters, husbands/wives, men/mistresses. The dealings between each unit of these dyads are usually bitterly framed as transactions, satirising the creeping effects of capitalism on Japan. While a Mizoguchi man situated within the hypocritical Japanese patriarchy is not worthy of the piety expected of his offspring (for he is weak, selfish and cruel); a Mizoguchi woman is often forced into a downward spiral of gruelling situations predicated by the unfair expectations placed upon her by Japanese society – to be a skilled, hard-working mother, a loyal wife, an obedient daughter, a flawless virgin, and the glue which holds the family together. For this sensitivity, Mizoguchi has been dubbed Japan’s first “feminist” director – the women in his films are central, he sculpts their characters with deep empathy, and he allows them a full range of emotions which give them the breadth of complex humanity, not the one-sidedness of mere martyrs or objects of love. Additionally, he directs his leading actresses, especially Yamada Isuzu, stellar here as the truly unfortunate Ayako, to transcendent performances. Perhaps Osaka Elegy introduces these themes in such a personal, universal way because it represents the first instance of one of Mizoguchi’s plots coming close to his own autobiography. In the film, Ayako, a telephone operator, is bound by the codes of filial piety to sacrifice herself for the needs of the men in her family. Her father arranges for her to become a mistress to his boss, Asai, and to work towards cancelling the debts he has accumulated in a failed embezzlement scheme. Ayako’s earnings also help her brother Hiroshi with his school tuition. Mizoguchi’s sister Suzu was herself sold by their father into prostitution at 14 to cover for a failed business gamble. With the money Suzu raised, young Kenji was able to enroll in art school. Ayako serves as an illustration of the contradictory philosophies that, in Mizoguchi’s view, left Japanese women few options but a life of ultimate misery. Honouring the family led to misery because parents were often unworthy of and ungrateful for the sacrifices made by female family members, using their children as disposable resources, not individual lives. Becoming an expressive individual led to misery because no Japanese man would take a woman not supported by her family and the group-oriented society would not support an individual, leading to further isolation. As Ayako continues to rebel and struggle to maintain dignity in her own way, she is forced out by the men around her – father, brother, boyfriend. These men are disgusted by her actions – even though they arranged and approved of them – while still taking the money and reaping the benefits. By the final exhausting close-up – of Ayako staring directly into the camera at the Japanese audience – she is severed from her surroundings. In previous long shots these surroundings had overwhelmed her, but now she’s without a family or country, on a bridge, lost in a no-man’s land.